If you're anything like me, you will wander around art fairs and galleries with a pen in hand and a tiny notebook where you scribble unreadable notes about artists and artworks that you have seen and enjoyed. It seems that this may not be the case any longer if you're the owner of an iPhone, as the app landscape takes to a new levels of usability for the art lover. From Thursday 3rd March to Sunday 6th March many lucky visitors will be able to experience a whole host of great art fairs in New York City, including Pulse, SCOPE, VOLTA NY, Fountain and Moving Image. So throw your notepads away as they're not necessary this coming weekend. Even if one of the artworks that you see isn't registered on the system, there is still the ability to make your own notes on the app about it so that you can track it down later on. 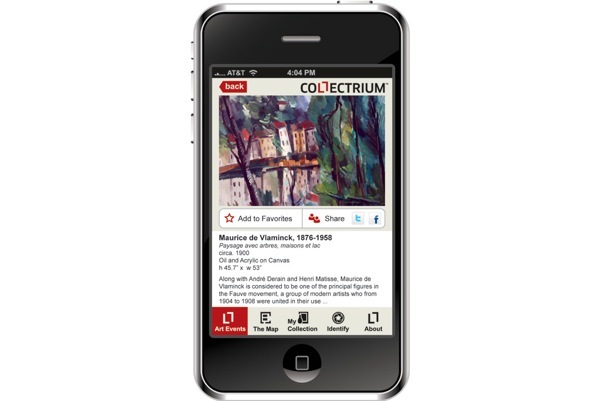 The app was created by Collectrium, which was founded by former Silicon Valley entrepreneur, Boris Pevzner and certainly makes an interesting addition to any tech-friendly collectors who will be making their way around the fairs this week. If anyone has the chance to trial the app in situ, let us know what you think!